From Tamashii Nations. 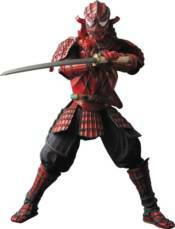 The hit Meisho series from Tamashii Nations everyone has been talking about is reimagining Marvel heroes starting with Samurai Spider-Man! Leave it to top sculptor and designer Takeya to take Spider-Man back to Feudal Japan in full, web-like Samurai warrior armor design. True to the feudal spirit, Samurai Spider-Man's ninja kaginawa-style grappling web hook is crafted as chain-like firing mechanism. Like the preceding movie realization products before it, Samurai Spider-Man is crafted with semi-soft materials that allow for superior articulations and dynamic posing. Set includes 3 interchangeable hands, a Japanese katana set, and a kaginawa web hook set (left and right wrist parts). SCARIF STORMTROOPER SQUAD LEADER - STAR WARS: ROGUE ONE PEN SPIDER-MAN MARVEL PEN TOPPER POP!